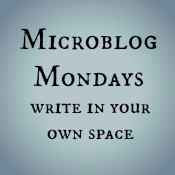 #Microblog Mondays 2: Quiet Happy. I have been getting up a half hour earlier every day to write in my journal – even if it’s just a word or two – for a month now. Even on the days where it feels like I have little to say, the experience of it has been so good for me. In the years of fertility treatments, where we were hoping against all odds to have a baby, the silence of my house mocked me; a reminder of how much I longed to be a parent and how scared I was that it wouldn’t happen. I avoided it at all costs; listened to music, talked over it, moved through it too quickly. Now, my favorite part of journaling in the early mornings is that stillness. On most days, it infuses in me a quiet happy which I can use as an antidote to the stress of the day. I love starting out my day communing with quiet words, coffee, and the sunrise. Thank you for all the support – it was a little scary, yesterday, to publish my idea. Because it’s so tenuous. I’m not SURE I want to teach, but I have an IDEA I want to teach. Very hard to throw that idea out into the universe when it’s not a real formulated plan. That said, I DO need a plan if this is something I want to pursue. The first obstacle is schooling if I want to be licensed to teach in public education. In Massachusetts the requirements for obtaining an initial license is that I complete an “Educator Preparation Program.” There are lots of flavors of this which I have spent time researching. I could do an immersion program – teach AND do classes at the same time, which would be incredibly hard to balance as a mother. I could do a masters program – there are many schools in the area, which have myriad options. Full time, part time, etc. I like this option; there’s a program which would ask only a weekend a month for me for a year and a half and then a student teaching assignment. I would like to get my license to teach in the public schools. Mostly because I don’t want to limit myself to only charter or private schools. But it requires an investment of time and money. Which I would wholeheartedly pursue if I KNEW my vocation was a teacher – that is, if it wasn’t just an idea. I just don’t know. I need to get into a classroom and see if I like it, or see how the education system works and whether I think I can handle the specific pressure on educators. And so I don’t think I’m in a place to move on this right now. The way I look at it, maybe I need to substitute teach*, or volunteer at the school, or work for a non-profit in education. Or maybe I start at a private school/charter school and go from there. I don’t think it’s a bad idea to change careers, reinvent myself, at age 40. It WOULD be a bad idea for me to do it without really KNOWING that this is something I want to do. Really, the bottom line is that I don’t want to waste money on a degree if it’s not going to make me happy. All careers have pros and cons. I might not like the work I am doing now, but I make good money and it’s relatively flexible. I often cannot imagine doing this for the next 10, 20 years, but I KNOW this career. It’s possible it might be better to stay where I am right now, too. So I will continue to research. And when Owen starts kindergarten next week, I’ll talk to his teacher about volunteering in his class, and see if the principal would be interested in me volunteering in other classrooms, too. Maybe I’ll see what’s involved with being a substitute and whether it’s something I can commit to when I don’t have an active work project. As much as I want to MOVE on this right now, I know I need to be practical and smart and make sure I know that this is the right choice for me. *Because, seriously. If you are a substitute teacher, you see the worst of kids. Sometimes the best. But the worst, too. If you can survive running the substitute teacher gauntlet and STILL want to teach, maybe that’s a vocation. At least, that’s what I figure. Owen and I took a road trip last week to visit my sister and other assorted friends and family. And, like most things, conversations turned to work and career and balancing all of it, especially as parents of young children. Even my retired aunt and uncle talked about how hard they thought balancing parenting and work is for everyone now (especially with the DC traffic – holy crap I do NOT know how people sit in that traffic day in and day out!). In the context of these conversations, I found myself talking with everyone about the positives of my working experience. And it struck me one afternoon: I actually kind of LIKE my job. It’s true: I don’t love being an accountant. But I do love my current work SITUATION. Because it’s flexible. I have one client through the rest of the year. Which means I can structure my work weeks the way I want them. I have been working 2 days a week in July, a few hours here and there from home, and therefore haven’t been stuck in the car for three hours a day, 4 days a week. I am able to take a week off, like last week, at sort of a moment’s notice. Without needing to apply for vacation time. I love that about my job. I love that I am in charge of when and how the day to day tasks get done. Of course, there’s times I am needed onsite, and days where I have my work reviewed and come away shaking my head and feeling like a loser and a failure. And the mornings where I have a 9am meeting and therefore HAVE to get on the road at 7:15 at the LATEST because otherwise I’d be too late and miss it. And then there are the days where the sheer drudgery of doing a job I don’t love makes me loathe to do anything at all. Where I spend the hour and a half drive home cycling through a list of careers and wondering if any of them might actually make me happy. For years now, I’ve spent countless hours thinking about what kind of career might make me happy. If you added up all the time and energy I’ve spent on it, it probably adds up to weeks of my life of thinking about what my ideal career would be. All that time spent ruminating – and I’m no closer to an answer. I’m 37 years old and I have no idea what I want to do with my life. I’ve been trash talking being an accountant now, for, what, 10 years? I don’t love it. I don’t like talking about it with people, because they assume I’m good at math (and trust me, I’m NOT. I rely heavily on my calculator!) and am one of those “finance people” who has no personality or communication skills. And there is always a part of me, deep inside, that wants to cry to these people who think I’m great at math and don’t have a personality or communication skills: But I love to write! And read! I was an English major and I played the clarinet and I have actually cried from the beauty of a piece of music! The fact is, I AM an accountant. An accountant who blogs and reads and cries when she hears beautiful music. I envy the Steve Jobs of the world; the people who knew exactly what they were meant to do and do it every day with passion. One of my best friends in college was like that: she knew from the moment she graduated high school that she was going to be a landscape architect. And damn if she doesn’t own her landscape architect business now. She loves what she does, and I often wish I had a career I could focus on with similar passion. I don’t. But I don’t HATE my profession, either. In fact, I love it right now: Love it for the flexibility, for the freedom to work as little or as much as I want to. I love that I can work from home without having to explain myself. I love that the quality of my work is what’s judged, not the time I spend in the office. I love that it changes and moves and I have to stay on top of changes and figure stuff out on my own. I love that I can take a week and do a road trip with my fast-maturing 5 year old in the summer before he starts school. I love that I can take him to dentist appointment and swim lessons and have family dinners ready and be able to run miles without having to worry about fitting it all in. I love that when he’s sick (or I am, since I have strep), I can adjust my schedule and not worry about long term career effects. And you know. Maybe it’s GOOD that I don’t love my job. Because this way, I can be around for my family and run and cook and travel and do things I enjoy, instead of having a single-minded focus on my career, my passion. And I’m now starting to wonder if my definition of “doing great work” has been too limited. Maybe doing great work, for me, means making sure that Jeff, Owen, and I have dinner together nearly every night. Maybe it means that I keep myself healthy and fit and mentally clear by running long distances. Maybe it’s about having the space and time to blog regularly, cook healthy meals, raise a happy child and have a happy marriage and life. Maybe that’s enough, and I can stop wasting my energy on trying to figure out the career which Steve Jobs said I should find.